Did you know that March 28 through April 3rd is National Cleaning Week? It's just to remind you that it is time for that spring cleaning we all hope to do. I know that sometimes Martha Stewart can be a bit overwhelming (where does she get the time to do all that stuff? ), but she does have two books on cleaning and caring for your home that are excellent. 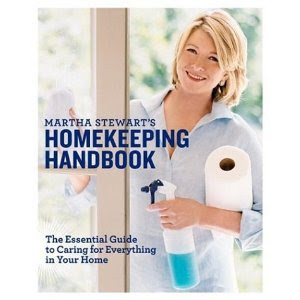 Martha Stewart’s Homekeeping Handbook (2006) is a comprehensive manual on how and when to care for various items in your home, with a room by room guide with weekly, monthly and seasonal checklists. There are also tips for cleaning and even help for folks who are moving. Good Things for Organizing by Martha Stewart (2001) is the second book I would like to recommend. Divided up by rooms (Kitchen, Bedroom, Storage Rooms, Workrooms, etc.) this book suggests, with both text and pictures, many ways to help organize your stuff. She also includes tips for re-using household articles in new and different ways, along with “how-to” directions for simple building projects.